Thanks to lovereading.co.uk for spreading the love. I’m thrilled to mention that on the eve of the UK launch of Black Dog Summer, Hive.co.uk has chosen it as their ‘book of the month’! Recorded in London in May 2014, here’s a short video of me talking about the book. A flamboyant member of the pea family, this tree is also commonly known as the coral tree, and umsinzi in Zulu. Its flowers draw a myriad birds and insects with a penchant for nectar, its bark is favoured by elephants, and the leaves are munched by baboons, black rhinos and assorted antelope. The flowering of the lucky bean trees is an excellent indication that it’s time to plant crops, while boiled bark is an ingredient in many traditional medicines. When the pods ripen and split, the rows of bright red seeds that fall have long been regarded as lucky charms, and are often incorporated into adornments and jewelery. This elegant, pastel-hued member of the Acacia family gets its common name from a long-ago misunderstanding. Early European pioneers found themselves contracting terrible fevers when journeying through or living in areas where these green-yellow barked thorn trees grew. They figured it must be the trees making them sick, but of course it was because the trees liked to grow in the swampy spots where malaria-carrying mosquitoes thrived. The acacia xanthophloea is quite unique, as photo-synthesis takes place in the bark because its leaves are so small. 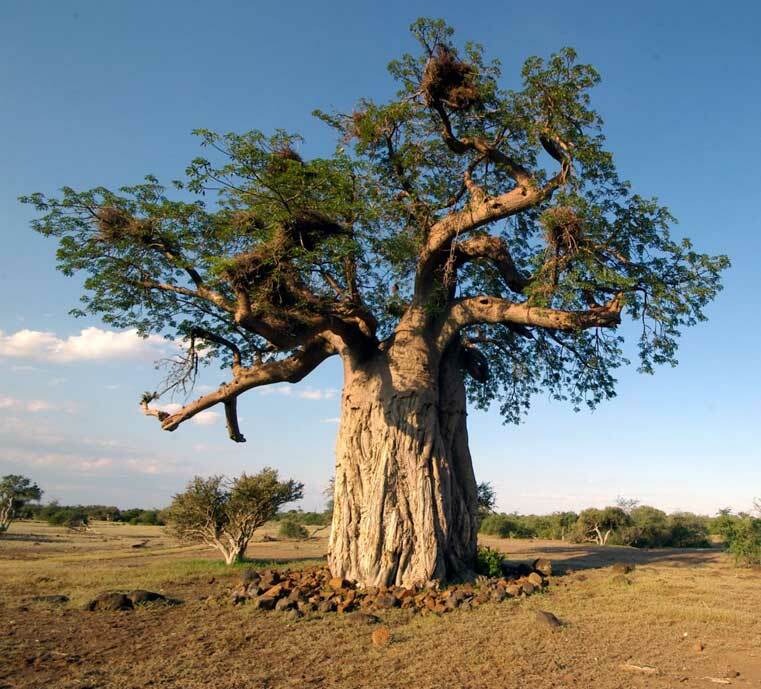 Often called ‘upside-down’ trees because it looks as if their roots are in the air, baobabs have a legacy of providing both symbolic significance and life-giving abundance to those who live close by. Their bark has been used for cloth, rope and fuel. They provide edible fruit and leaves and catchment basins and reservoirs for vital rainwater. Due to their ability to weather all sorts of abuse by rope-weaving humans and hungry elephants, and the way that they sprout to life even when cut down completely, they’ve come to symbolize endurance and longevity, as well as community, as tribal meetings are often held in the relief of their shade. This magnificent South American tree was first brought to South Africa in 1880 to add a splash of ornamental colour to the dusty palette of the savannah. It has flourished along the streets and in the gardens of the older suburbs of Johannesburg, and has entirely colonised Tswane (often referred to as ‘jacaranda city’). It’s considered an invasive species, which means we’re not allowed to plant any new ones, but the rich blue-purple canopies still serve as a reminder that elements brought in and transplanted from far-off lands only add to what makes South Africa uniquely South African.